Fiction: We are not Catholic, so Seton won’t accept my child. Fiction: I will need to drive my child to school every day. Fact: State law requires home school districts that are within 15 miles of Seton to provide transportation to students from their district. Seton is home to students from Brighton all the way to Rush Henrietta and Greece (free of charge!). Fiction: Everyone is the same at Seton. My child will not fit in. Fact: At Seton, we are proud to host students from multiple districts such as Rochester City School District, Pittsford, Brighton, Rush Henrietta, Greece, East Irondequoit, and Palmyra-Macedon School Districts. We find that it takes a wide variety to make a great collection. Fiction: It’s a private school, they don’t follow Common Core Standards. Fact: Both the Math and ELA programs that are taught at Seton are strictly aligned to New York State Common Core Standards. The students who attend Seton Catholic School go on to excel in local private, Catholic and public schools. Fiction: Sports and extracurricular activities are not emphasized at Seton. Fact: Seton offers a wide variety of extracurricular activities including CYO Athletics, STEM Club, Chess Club, Running Club, Theater Arts and Spanish Club, just to name a few! Fiction: There will be no opportunities for me to get involved. Fact: There are several occasions to help in your child’s classroom, ranging from assisting with “centers” to volunteering as a library or lunch parent. Beyond the classroom, there are many opportunities to volunteer and build community. The Seton community is one of our school’s biggest assets. Fiction: Seton is just too expensive. Fact: Enrolling your child at Seton is an investment in their academic career, but it is affordable. In an effort to keep tuition manageable, Seton offers various scholarships and financial aid for those who qualify. 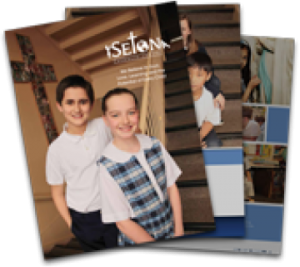 The Diocese also extends a $500 tuition credit to any new family referred by a current Seton family. Fiction: Seton Catholic School just is not the right place for my child. Fiction: Private schools don’t offer wrap around options for working parents. Fact: Seton Catholic School offers Wrap Around Care to all students in preschool through grade 6. With an AM, PM or FULL DAY WAC program you can build an extended day program suitable for your schedule. Seton offers the longest AM/PM extended day (5.5 hrs/day) in the Diocese! Fiction: Seton’s class sizes are way too big. There is no individual time for my child. Fact: Seton’s class sizes are modest and personal. Because we are a private school, our classes are not overflowing with children. Which makes management and individual student attention a great deal easier. At Seton Catholic School we are proud to have a personal relationship with each child and his or her family!